Monday may be a dream come true for space fans, with a rocket launch, Mars and total lunar eclipse aligned in a truly epic cosmic triple play of live webcasts online. A SpaceX Falcon 9 rocket and Dragon cargo ship stand atop its Florida launch pad ahead of a planned April 14, 2014 launch to the International Space Station. The mission for NASA will launch from Cape Canaveral Air Force Station. SpaceX plans to launch a Falcon 9 rocket carrying the Dragon spacecraft at 4:58 p.m. EDT (2058 GMT) from a pad at Cape Canaveral Air Force Station in Florida. There will actually be two webcasts of the launch, one by NASA and the other provided by SpaceX. NASA's webcast begins at 3:45 p.m. EDT (1945 GMT), while SpaceX's video feed will begin at 4 p.m. EDT (2000 GMT). You can watch both webcasts of the SpaceX Dragon launch on Space.com. The late afternoon launch will mark SpaceX's third cargo mission for NASA. The company holds a $1.6 billion deal to make 12 such flights. For this flight, Dragon will carry about 5,000 lbs. (2,268 kilograms) of supplies, scientificexperiments and hardware on this run, including two legs for NASA's humanoid Robonaut 2 droid on the space station. SpaceX also plans to deploy a set of tiny satellites as secondary payloads on the launch, and test a novel reusable rocket technology using the Falcon 9 booster's first stage, which has been outfitted with four large landing legs with the goal of simulating a re-entry maneuver as it falls back to Earth, then a landing maneuver before splashing down in the Atlantic Ocean. While SpaceX's rocket launch will dominate the space news during the day, when the sun sets, it's time for Mars and the moon. The Slooh community telescope, NASA and the Virtual Telescope Project will offer live views of the events in four difference webcasts. A series of four total lunar eclipses in a row is called a tetrad. See how four blood moons of a total lunar eclipse tetrad work in this Space.com infographic. You can watch Space.com's night sky webcast page for live views of Mars late Monday, then stick around for no less than three feeds of the total lunar eclipse from observing sites across North America. Mars will take center stage shortly after Dragon blasts into orbit. The Red Planet passes within just 57 million miles (92 million kilometers) of Earth Monday — its closest approach since January 2008. After sunset, Mars will be an orange beacon overhead, blazing as brightly as Sirius, the most luminous star in the sky other than the sun, experts say. 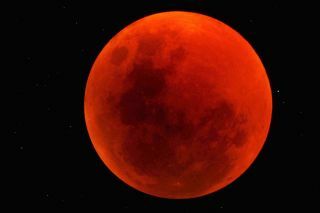 But main event for the night will be the first total lunar eclipse of 2014, which will be visible from all of North and South America, as well as Hawaii and part of Alaska. It is perhaps the most exciting of the night's events (though it technically begins early Tuesday morning Eastern time). The Slooh, Virtual Telescope Project and NASA webcasts will all run concurrently during the total lunar eclipse. NASA will also offer a live chat with scientists during the eclipse, beginning at 2 a.m. EDT (0600 GMT) Tuesday and running the duration of the moon event. You can follow NASA's webcat live here. The lunar eclipse will begin at 12:53 a.m. EDT (0453 GMT) Tuesday (April 15), when the moon plunges into Earth's outer shadow. The "totality" phase, in which the moon is completely veiled by Earth's shadow, starts at 3:06 a.m. EDT and lasts for more than an hour, ending at 4:24 a.m. EDT. The moon should be quite a dramatic sight during the totality phase, experts say. "Sunlight bent by our atmosphere around the curvature of the Earth should produce a coppery glow on the moon," Space.com skywatching columnist Joe Rao wrote in an April 8 guide. "At this time, the moon, if viewed with binoculars or a small telescope, will present the illusion of seemingly glowing from within by its own light." The moon will emerge completely from Earth's outer shadow at 6:37 a.m. EDT (1037 GMT), bringing an official end to the eclipse. The upcoming shadow dance is the first total lunar eclipse since December 2011, but the world won't have to wait so long for the next one. Tuesday's event is the first of a "tetrad" of four total lunar eclipses occurring at roughly six-month intervals. The next one will occur on Oct. 8 of this year, and the other two on April 4 and Sept. 28 of 2015. Editor's Note: If you snap an amazing picture of SpaceX's launch, Mars, the total lunar eclipse or any other night sky view that you'd like to share for a possible story or image gallery, send photos, comments, and your name and location to managing editor Tariq Malik at spacephotos@space.com.